What if I told you the biggest innovation of the 21st century wouldn’t be Artificial General Intelligence, genetically engineering humans, or connecting our consciousness with a brain-computer interface to live forever, but instead… a digital chain of blocks. You probably wouldn’t believe me, and that’s why I’m not going to claim that! Instead, I’m going to explain to you why what sounds like digital lego is actually still really cool (I promise). First, what on earth am I talking about? Easy- a glorified linked list secured using a cryptographic hash function that eradicates the problems of double spending and Byzantine Fault Tolerance by functioning as a decentralized and immutable ledger of data indefinitely. By the way, don’t forget to invest 1000 ETH into my ICO using nanomaterials in a VR world to leverage CRISPR to enable the development of Brain-Computer Interfaces that optimize quantum machine learning!!!!!!!! If you don’t know what I’m talking about, don’t worry- I don’t either. Lesson number one about blockchain (that’s what I’m explaining if you’re actually completely new to this and had no clue what I’m saying, sorry about that it gets better from here)- most people (like me) somewhat involved in the space, don’t know what they’re talking about. So how do you tell the fluff from otherwise? It’s hard- but I’d recommend getting a good grasp of established primary sources such as the original Bitcoin and Ethereum whitepapers, and deducing from there. Oh yeah, I’m getting ahead of myself, that’s what I’m supposed to be explaining to you. How Did This Whole Bitcoin/Blockchain Thing Start? Once upon a time, there was a guy/girl/group of people under the pseudonym Satoshi Nakamoto who was pretty pissed off with the current financial system- I would be too at the time of the 2008 recession. Our leaders were corrupt, greedy, and lots more fun things (great movie to understand what happened in a fun way here). So, like a diamond in the rough, out came the release of the whitepaper of Bitcoin on Halloween of 2008- definitely a better treat than whatever your kids came home with that night. Remember, Bitcoin is the first application built on a blockchain, they are not interchangeable terms. Bitcoin used the blockchain to store information about the movement/balances of currency, and for a while, that was all there was to it, until…. Vitalik Buterin has become probably the most recognizable face in crypto, and with good reason. Bitcoin seemed to be all there was to blockchain, until Vitalik’s idea in 2013 (first described here) to decentralize, everything! “Bitcoin keeps track of money on something called a blockchain that removes intermediaries, and that’s nice and all, but there’s a whole lot more potential for this new tech. I want to use the blockchain to make tons of cool stuff, but it’s a massive struggle to build a whole new blockchain from scratch for every single application. Plus, then we would have to deal with making all existing applications interoperable (able to work with one another). To introduce you to some of the crypto jargon, the code Vitalik is talking about is often referred to as smart contracts. 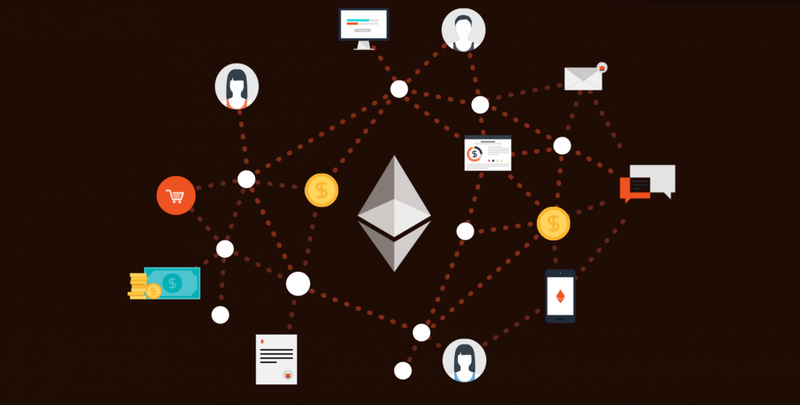 People code smart contracts on the Ethereum blockchain to be able to create decentralized applications that function without any central entity. Any given decentralized application may also have its own token for operations within the application, and the cost to actually run the application is paid in Ethereum’s native currency, Ether. How many of you got scammed out of your money after doing odd jobs for neighbours as a kid? Just me? Okay well, that’s awkward… just bear with my example then. Let’s say you promised to paint your dad’s friend Joe’s house in exchange for 20 bucks to get a new lego set. You paint it, Joe is happy, and then sends you off with no payment. Being 5 years old, you are too scared to bring it up. How could you reasonably have solved this situation? Give your money to a trusted mutual friend who ensures that he’ll either give it back to Joe if you don’t do your job or give it to you when you complete it. The problem is, that trusted mutual friend could go rogue and run away with your lego fortune. It’s a good thing that you can now build a decentralized application on Ethereum that replaces the trusted friend with code (the smart contract), and it can never go rogue. This is a simple example of a Dapp being used as an escrow account. Joe sends money to the smart contract, it simply checks when/if you did it, and either sends it to you or sends it back to Joe- whether Joe suddenly feels like backing out or not. Kids around the world hearing about escrow applications on Ethereum. An example of a real application that has been built out on Ethereum is Augur– a decentralized application built on top of Ethereum. It is a betting platform where users can put money down to predict certain outcomes (who wins the election, who wins the World Cup, anything and everything). Bets are made using Ether, and Augur uses its token as a metric for a user’s reputation- it’s used to report or dispute the outcomes of events which users are rewarded for reporting correctly. Why does it make a difference whether it’s on Ethereum or on servers at my house or even on Google’s? Well, no matter how angry Donald Trump is about the fact 1000s of Ether are being put towards debating whether or not his hair is real, he can’t shut it down- no one can- this victory against censorship is massive for some applications of the technology. That face you make when crypto has found you out. Let’s talk about one more thing relating to Ethereum- ICOs. If/when a decentralized application decides to launch its own token, a value must be assigned to it and there must be a way to distribute them- this is achieved through an ICO. Projects will crowdfund money in the form of Ether that anyone can partake in an exchange for a certain amount of the token. While this is an ingenious way to democratize investment that many legitimate projects have benefited from, as with anything there are always those looking to exploit the system. There have been numerous scams with project founders simply running away with the Ether, and that’s why please please be especially careful in investment (as you should always be). 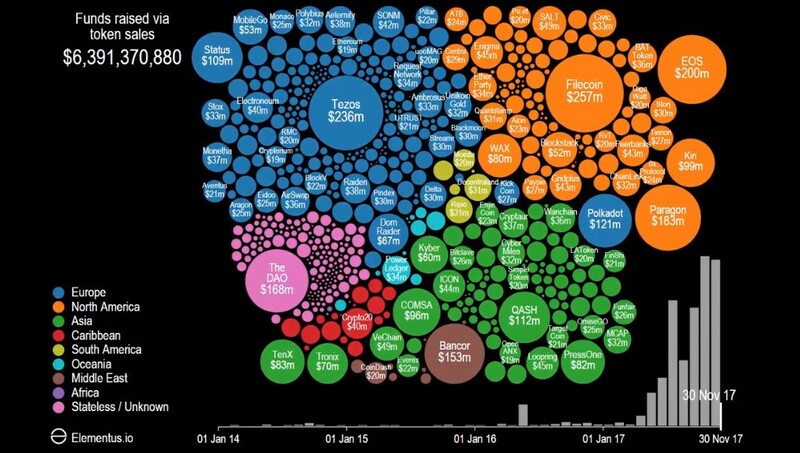 If you’re interested in the statistics of 2018 so far, click here (spoiler over 20 billion dollars has been raised just this year). Platform: These are the so called “Ethereum killers” aiming to have an easy to use way to build decentralized applications on top of them. Ethereum lead this revolution, followed by platforms such as Cardano, Neo and QTUM. Privacy: A common misconception is that bitcoin is anonymous- it’s not. However, there are many coins working in the field such as Monero, Zcash, and Dash. Security Tokens: According to Polymath, the tokenization of securities cause a bigger revolution than that of Ethereum and utility tokens. What this means is the representation of common assets, such as equity in a business, or ownership of a house, in the form of tokens which would increase liquidity and allow easier access. Currency: This one should be fairly self-explanatory. Bitcoin’s goal is to establish itself as the world’s new currency. It’s still leading the charge in the space, but many others are trying their luck at becoming alpha crypto including the likes of Bitcoin Cash, Litecoin, Nano, and countless more. (Side note, I didn’t get into explaining how there can be multiple variations of one coin- Bitcoin, Bitcoin Cash, in this article, so for information on that go here). IoT: IOTA intends on powering the ecosystem of the future. Once IoT devices become commonplace, the amount of data obtained and shared will lead to the breakdown of inefficient, centralized methods of data transfer. IOTA is attempting to create a fee-less method of transferring these enormous amounts of data between devices. Supply Chain: Because of the immutability (inability to be altered) of blockchains, using them to verify steps along a supply chain process, such as for example verifying products were created in a manner of fair trade, is a very attractive idea. Projects like VeChain, Ambrosus, and Waltonchain are working on this. Utility: These are the projects that can be easily built on top of platforms such as Ethereum and Neo, and completely vary in use. Commonly they employ what is called a utility token onto their platform to use for a specific behavior. An example of this is Steemit, a writing website similar to medium, where users are directly paid by readers for their work. Stable Coins: An exciting part of blockchain research right now is seeing if we could create a nonvolatile currency without a centralized entity like the federal reserve regulating it. There are two main types of this crypto-collateralized (example being MakerDAO) and seigniorage shares (example being Basis). Energy: Imagine we could trade energy directly amongst users. Several projects are working on making this a reality, such as Power Ledger and WePower. Marketplace: Blockchain enables a peer to peer exchange of not only countless services, but also tangibles. You can trade your data for a profit on Datum, buy and sell products directly on Open Bazaar, and countless other applications! Realistically, 95% of these projects probably won’t be used or even exist in 5–10 years. Is that sad? No. That’s just how the market works. Most projects will consolidate into something useful, because honestly, we’re not going to use (and we definitely don’t need) 1500+ projects. Don’t get too caught up on the hype, focus on the tech, which I hope by now I have convinced is cool.